2P START! Live! : Low Riders Edition | 2P START! 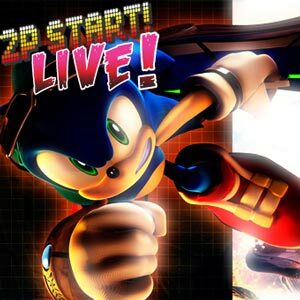 This episode, Ray talks about his ‘wonderful’ experience with Sonic Riders: Zero Gravity, and delves into deeper questions such as: When will Sega stop making mediocre games? Also included are our bread and butter: Comic Talk, Black Doom Award, Trivia for You, and back with a vengeance, the Suggestion Box! haha! I was like, what? Did I miss something? Did Ray add something I wasn’t aware of? But it was me! Sorry, not last weeks… Episode 11’s Trivia. I feel stupid, every week I guess on the “Trivia for You” and I’m always wrong. Oh, well, still fun to try But why don’t ya’ll change up the “Trivia for You” and not only do music, but how about trivia questions or qoutes or something? I don’t now, just a suggestion. NO TURBULENCE!!!! That’s ridiculous, and the first one was pretty good and had a good deal of potential to become a good, even great, game. And the insane speed was great ! And I have a Black Doom Award this week. Super Mario Galaxy. In any given stage, you can only collect 999 star bits! And it’s alot yes, but I was in a stage and got 999 star bits, and couldn’t get anymore! it really did upset me. No lie. Episode 11’s trivia winner was hyper. We haven’t updated the contest winner’s page because we’re waiting for hyper’s picture! Nothing will make you more famous then really goofing up badly. I normally don’t enter contests, And having my face as a contest trophy didn’t really interest me much. I personally think Sonic CD was the best game ever made with Sonic in it, so it surprised me how people were having a hard time with guessing it, so that’s when I decided to enter. Of course, the music people were really having a hard time guessing was right after that one and I mistook it for the background music as well as I couldn’t even recognize it myself (and that probably helped me in not noticing it.) This is what I get for listening to these podcasts from last to first. Unfortunately I also have an extremely low self esteem and took about one or two hours to fully recover from this last podcast and post a comment. But overall, I liked it. And I thought it was very funny. See, how could have hyper known he was the winner if you didn’t announce it! Well, I did email him, but I screwed up the subject line somehow, so it probably looked like spam. Sorry about that!